Countries are scrambling to get to Mars in a good ol’ fashioned space race. But focus might be shifting to the red planet’s two moons. According to reports, Japan announced plans yesterday to bring its asteroid-probing technology to the tiny Martian satellites. JAXA, the Japan Aerospace Exploration Agency, says it wants to scope out Phobos and Deimos, Mars’ two moons, as early as 2022. It’ll nab samples that’ll tell us about Martian history and help us prepare for future manned missions to the planet itself. JAXA plans to build upon the tech it used with its history-making Hayabusa probe. 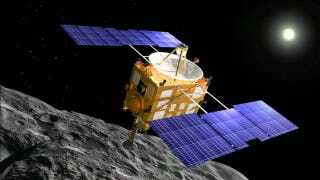 In 2010, Hayabusa became the first probe ever to land on asteroids, collect dust samples, and ship ‘em back to Earth. JAXA’s announcement comes at a time in which Phobos and Deimos are budding celestial celebrities. Last week, Space.com reported NASA’s conceptual plan to build a base on the ten-mile-wide Phobos that could allow for easier, cheaper, less risky human access to Mars. Back in 2011, Russia had its own plans to reach Phobos, but failed. Hayabusa-like asteroid-combing technology could prove useful in finding out more about the two moons’ origins, as well. They’re small and kinda lumpy, and resemble asteroids more than moons. This leads some scientists to think Phobos and Deimos were pulled into Mars’ orbit from the asteroid belt. P.S. : “Phobos” means “fear” and “Deimos” means “panic,” which aren’t great omens—but the moons’ role in human space exploration seems to be becoming more key.